On January 14, 2019, the Wuhan HydraV 2018 annual results conference was successfully held. 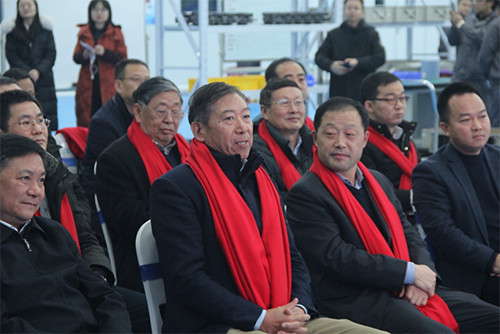 Wuhan Economic Development Zone Secretary Hu Hongchun, Standing Committee Dehua Zhang and other government leaders, heads of hydrogen energy industry partners and investors in the field of hydrogen energy attended the event. Dehua Zhang , member of the Standing Committee of Wuhan Economic Development Zone, Huanong Zhang , Chairman of Vision Group, and Yun Xiong , Wuhan HydraV CEO, delivered speeches. Wenyu Zhang, Director of Wuhan HydraV Project, presided over the meeting. At 3 o'clock in the afternoon, the conference was held on time at the Wuhan HydraV engine plant. Wuhan HydraV CEO Yun Xiong delivered a speech. Yun Xiong welcomed the arrival of distinguished guests and expressed his heartfelt gratitude to all of you for your concern, support and help to Wuhan HydraV. Next, Yun Xiong reported on the results of the three projects of Wuhan HydraV 2018: First, the 45Tw fuel cell engine XTQX3045C independently developed by Wuhan HydraV has excellent performance, and the power-to-volume ratio and mass-to-volume ratio are second to none in China. Second, Wuhan HydraV has broadened its layout in the hydrogen energy industry chain and has formed a closed loop of the industrial chain. Thirdly, Wuhan HydraV has taken the lead in hydrogenation hydrogen production. It has established the first hydrogen refueling station in Hannan District,Hubei Province. Its daily hydrogenation capacity is 1000kg, which is the world's leading level. Datong Hydrogen Station has also been completed. It is the first in Shanxi Province.Yun Xiong said that Wuhan HydraV can achieve such gratifying results in just ten months, and it is inseparable from the support and help of leaders at all levels. With the love and confidence in the hydrogen energy industry, Wuhan HydraV will continue to work hard and continue to develop. Yun Xiong then looked forward to the company's development vision for the next three years: in 2019, plans to promote the research and development of the reactor and its key components such as catalysts and membrane electrodes in Wuhan, Datong, Shenzhen, Guangzhou and Shanghai. Establish an operation and maintenance electronic control platform for fuel cell vehicles. In the four major sectors of Central China, East China, South China and North China, the complete layout of the hydrogen energy industry chain has been completed and a good reputation has been formed. Subsequently, the Standing Committee of Dehua Zhang of Wuhan Economic Development Zone delivered a speech. On behalf of the Administrative Committee of the Party Working Committee of Wuhan Economic Development Zone,Changwei Zhang first expressed his gratitude to the distinguished guests present. Subsequently,Changwei Zhang strongly praised the growth rate of Wuhan HydraV. Ten months after the start of the project in March 2018, Wuhan HydraV has achieved many achievements - the first phase of the engine production line has the capacity to be put into mass production, the membrane electrode production line has also been completed, and the first hydrogenation project in Hubei Province invested and constructed. Station - Hannan Hydrogen Station was completed and equipped with the capacity of 1000 kg of hydrogen per day. The 20 fuel cell buses powered by Wuhan HydraV have been put into trial operation. Wuhan HydraV has made outstanding contributions to the development of the hydrogen energy industry in Wuhan. 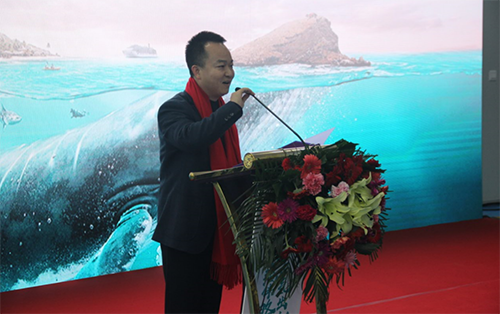 Changwei Zhang said that in 2019, a key year for the transformation and upgrading of Wuhan's new energy industry, the government of the Economic Development Zone will optimize its policies to provide more convenience and support for new energy industry enterprises, and wish Wuhan HydraV to create more glory. Finally, Huanong Zhang , Chairman of the Vision Group, delivered a thank-you speech. Huanong Zhang first expressed gratitude and praise to Wuhan HydraV for the considerable benefits brought by Vision Group, and especially praised the hard work of the project team led by Yun Xiong . Chairman Zhang said that the Wuhan HydraV Wuhan Industrial Park, which is currently under construction, will be unique in terms of scale and industrial coverage. At the same time, Wuhan HydraV already has its own core technology in fuel cell membrane electrodes. In 2018, 20 fuel cell buses in Wuhan and 50 fuel cell buses in Datong have been put into trial operation. It is planned to expand this number to 300-1000 units in 2019. Chairman Zhang also thanked the leading figures in the domestic hydrogen energy academia, such as Professor Liao from South China University of Technology, Professor Sun from TONGJI UNIVERSITY and Professor Pan from Wuhan University of Technology, and their counterparts and partners for the hydrogen energy industry. Contributions and concerns about Wuhan HydraV, as well as government leaders' support and help to Wuhan HydraV. Finally, Chairman Zhang wished everyone a happy New Year and all the best. After the press conference, everyone came to the fuel cell vehicle site powered by Wuhan HydraV. A 10.5-meter bus, four 8.5-meter buses and a logistics vehicle waited for the test drive in the cold winter. Eight salutes were sung, and the fuel cell buses carrying the guests were successfully tested and inspecttion. CHFCE, HBTV, HUBEI DAILY, TrendBank, GAOGONG Hydrogen and other mainstream media in Hubei Province and the new energy industry witnessed this grand event.